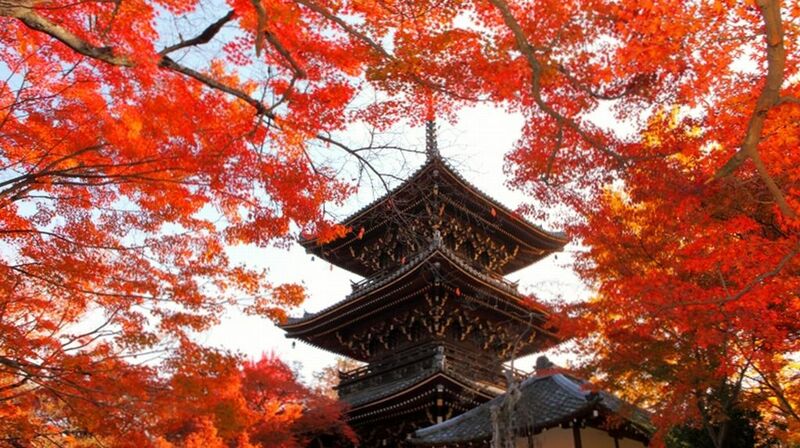 A beautiful three-storied Pagoda is framed by cherry blossoms and autumn colors. Shinnyo-do, located in Kyoto near Ginkaku-ji, is a temple of the Tendai Sect. The Temple was established in 984 by a priest from the important Enryaku-ji Temple. The Amida Nyorai is worshipped as the deity of women. The temple’s buildings were destroyed by war and fire many times, but fortunately the Amida Nyorai statue was rescued. After a couple of relocations, this statue was once again enshrined at the current location in 1693 when the temple was rebuilt. The main hall has a beautifully decorated inner chamber with a large gold leaf dome, and a few more rooms with elegant paintings on their sliding doors. Visitors can see the temple’s beautiful two gardens, a contemporary dry garden with a borrowed scenery, and another dry garden with rocks, gravel and trees. There are many buildings in the temple ground, including a three-storied pagoda. In spring, the over 70 cherry trees color the temple, and from late November to early December, red maple, and yellow ginkgo trees beautifully frame the main hall and the pagoda. It’s a beautiful scenery to see. Access : From Kyoto Station,Take Kyoto city bus No. 5 in about 35 mins then get off at Shinnyodo-mae bus stop. Or 20-minute walk From Ginkaku-ji (Silver Pavilion).